No appointment is necessary. But a Liability Release form and a Patient Consent form need to be completed by all who receive an immunization. You may complete the forms in advance or upon arrival at the clinic. There are many flu viruses that frequently mutate. Each year a new flu vaccine is made to protect against three or four viruses that are likely to cause disease in the upcoming flu season. In the event that the vaccine does not match these viruses, it may still provide some protection. It takes approximately two weeks for protection to develop after vaccination, and protection lasts through the flu season. This year, we will be offering the Quadrivalent vaccine, which protects against four different strains of influenza, as well as the High Dose vaccine for seniors. According to the CDC, adding the 4th strain significantly broadens the protection against circulating flu viruses. You should not get the vaccine if you have any severe, life-threatening allergies, if you have ever had Guillain-Barre Syndrome, or if you are not feeling well. Please refer to the CDC website: www.cdc.gov/flu for further information. For more information, contact Maureen Mitchell (HCC) at mitchellm@reed.edu or extension 7831. 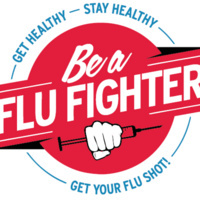 Be a flu shot hero and get vaccinated. Protect your family, friends and the community!